Until your GridGuard server has been supplied with a valid certificate, you will want to click the Allow Invalid SSL checkbox. On switching focus to the realm field, the application will communicate with the GridGuard Server. If there is only one realm setup for GridSoftToken, the value will be automatically populated. 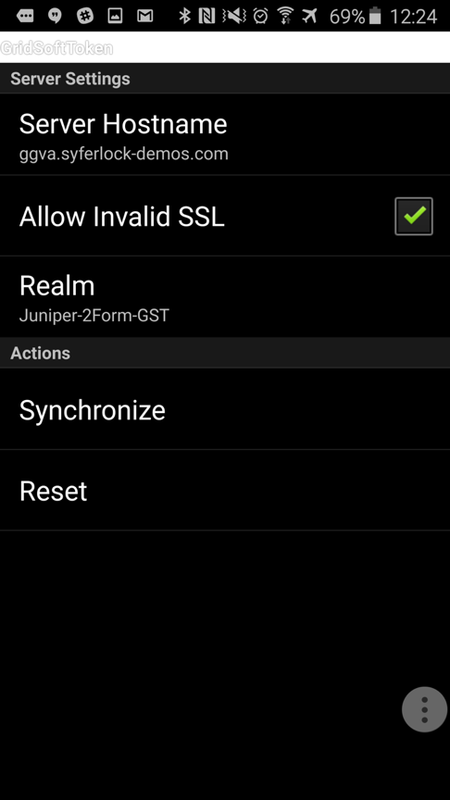 Otherwise, a list of valid realms configured for GridGuard will be displayed, and you will select the appropriate GST Realm and click. 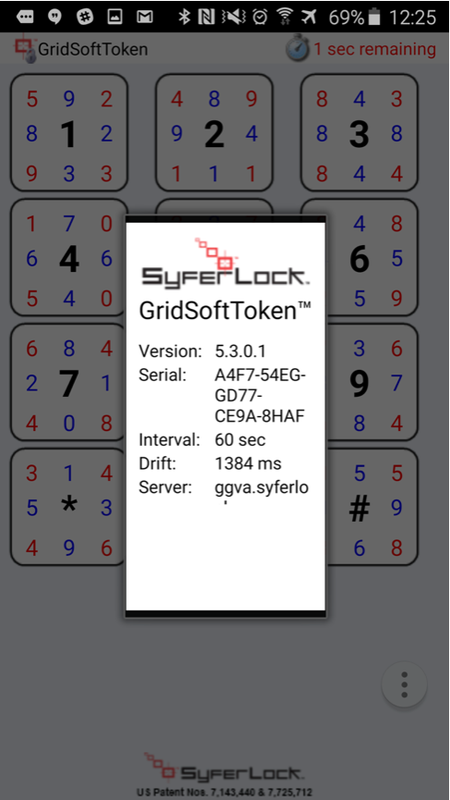 The application will communicate with the GridGuard Server and Realm and perform the initial time synchronization. Server Settings screen is displayed. If the GridSoftToken realm is setup to use a passphrase to generate unique serial key, the Set Passphrase window will be displayed after the user has chosen the Server and Realm. Confirm the passphrase, this will generate a unique serial key based on the passphrase. The application will generate a unique serial key based on hardware specific details. The current version of the Application uses the Menu Button to access the "License", "About", and "Preferences" displays. The method used to access the menu button is different for each device so you will need to check with your phone manufacturer. The About dialog is where the Serial number is displayed. Pull up the Application Info display. Note the serial number displayed on the screen. It will be used to register this device to the user's account. Close the Server Settings, or Application Information displays. 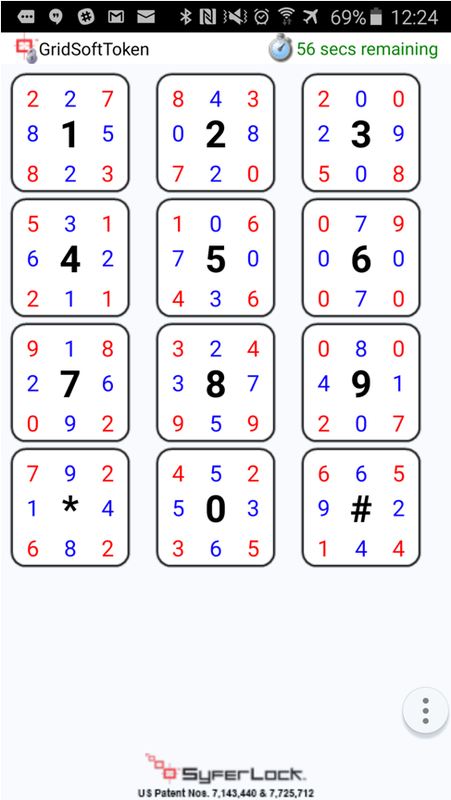 The grid will automatically be displayed. Any subsequent launch of the application will, by default, display the grid. Periodically, it might be required to synchronize the device with the GridGuard server, if either the server clock or the device clock goes out of synch. To synchronize the device, click on the Synchronize button in the Preferences display. The app will automatically contact the server and synchronize clocks. Note: Clock synchronization does not involve changing the clock time on either the server or the client. It is purely a calibration check that determines the offset so that the app is aware of the difference.